In this last of three parts, we’ll explore more of the rich web of ideas that inspired Egyptians to build so big. 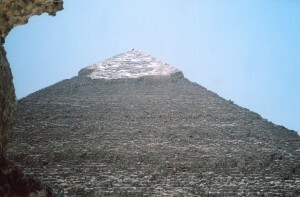 Pyramids were linked with a cycle of myths that was central in ancient Egyptians’ concepts of order. The god Osiris ruled the realm of the dead. He once was a king who civilized Egypt. Everybody loved him, but his brother, Seth, was jealous. He had a coffin made according to Osiris’ measurements, invited him to a party and tricked him into lying inside it. Seth’s henchmen nailed the lid shut, threw it into the Nile and let it float down the river. Be careful about what you drink at parties! Osiris’ sister and wife, Isis, searched long and wide for him. She found the coffin at Byblos, and took it back to Egypt. She opened it in a secluded spot in the marshes, threw herself on Osiris’ corpse, and wept. The gods pitied her and revived Osiris enough to impregnate her. She gave birth to a son, Horus. But Seth found Osiris while hunting, and tore his body into 14 pieces. He scattered them all over Egypt. Isis again wandered all over the land. She found every piece and buried it at that spot (some versions of the story say that his whole body was put back together and buried at Abydos). The gods restored Osiris, and established him as the ruler of the dead. When Horus became a man, he battled Seth and won Egypt’s throne. Egyptians associated Osiris with the death and rebirth of vegetation. Many other Middle Eastern and Western cultures imagined dying gods and associated them with crops–Tammuz, Adonis and Attis were mourned in rituals until they were restored. But the Pharaoh was so central in Egyptian thought that he became Osiris when he died and entered the Afterlife. Egyptians, with their tendencies to focus on the renewal of life, conflated Osiris with the ideas we saw in the first two posts. Egyptians had already seen the Pharaoh as an incarnation of Horus. They imagined Horus as a falcon, which soared above all other living beings. The Pharaoh was thus transformed into Horus’ father, Osiris when he died. This happened at the pyramid. Why did Egyptians imagine the son becoming the father when he died? One reason might have been political. Horus and Osiris had cults in different cities. So this myth was a convenient way to link all people when Egypt was unified. But this idea had deeper appeal. By 2500 BCE (when the pyramids at Giza were built) the cult of the sun god Re became central, and most scholars have seen the pyramids as monuments to the sun. They embody its rays. You can see the remains of the pyramids’ limestone casing in the picture above. I was spellbound as it shined under the noon sun. 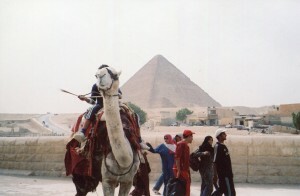 Imagine how much the pyramids at Giza awed people when they were new. But some specialists have questioned this fusion of the pyramids and the sun, and they see more connections with the stars. The Great Pyramid was aligned with the north. Egyptians associated the circumpolar stars with gods’ souls because they never set. But most scholars think that the pyramids were probably associated with the sun. Whether they were or not, pyramids were fused with celestial bodies that are either permanent, or constantly renewed. So pyramids allowed Egyptians to double dip–they got new crops every year, and achieved the permanence of stars when they died. 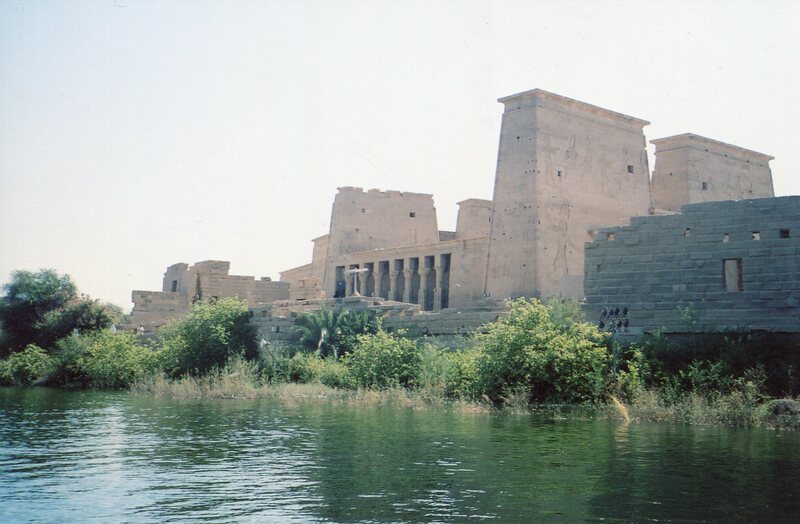 Egyptians saw life as unified, like a river. It wasn’t as hard for them to imagine Horus becoming Osiris as it would have been for most ancient Greeks, who liked defining things. Both gods were descendants of Atum, the original creator. He was identified with the setting sun. Re was identified with the noon sun. 1. The rebirth of vegetation. 2. The Nile’s annual flooding. 1. The original mound of creation. 2. Concepts of the soul becoming radiant. We rightly admire the pyramids today. But equally impressive is the wealth of ideas that inspired them. These concepts were rooted in countless centuries of experience living on the banks of the Nile. Diverse people had settled there, formed villages and towns, and cooperated to grow the most crops as the great river flooded. They focused on this renewal, living peacefully, and enjoying the good things in life. The basic ideas that a culture coalesces around have very deep roots, and many dimensions. Human societies have yet to organize around better ideals than what ancient Egyptians held. As we push our ecology and financial systems to the breaking point, we can learn a lot from them.